Wouldn’t a net be easier? Riding home from Folsom yesterday on the American River Parkway, I noticed a lot of fisherman lined up along the Nimbus Dam. I thought this was a bit odd for a Thursday afternoon, so I took a few photos. As I road past the Nimbus Fish Hatchery I noticed a lot of birds congregating in a shallow area of the river. So, I stopped to investigate. I ran into a nice woman who was also interested in what was going on. She informed me that this was the annual salmon run. Department of Fish and Game opened the gates at the hatcheryâ€™s fish ladder Tuesday to begin collection salmon for the fall spawn. Each year, the Nimbus Hatchery raises 4.2 million salmon. In a brilliant display of nature, the salmon flip their powerful fins and lunge from the water as they climb the hatcheryâ€™s ladder. At the top, the fish are stunned by an electric jolt and then spawned by hatchery workers. Yikes. That is some reward for a hard day’s (week’s? month’s?) work. I am curious to check out the fish ladder though (very cool photos). 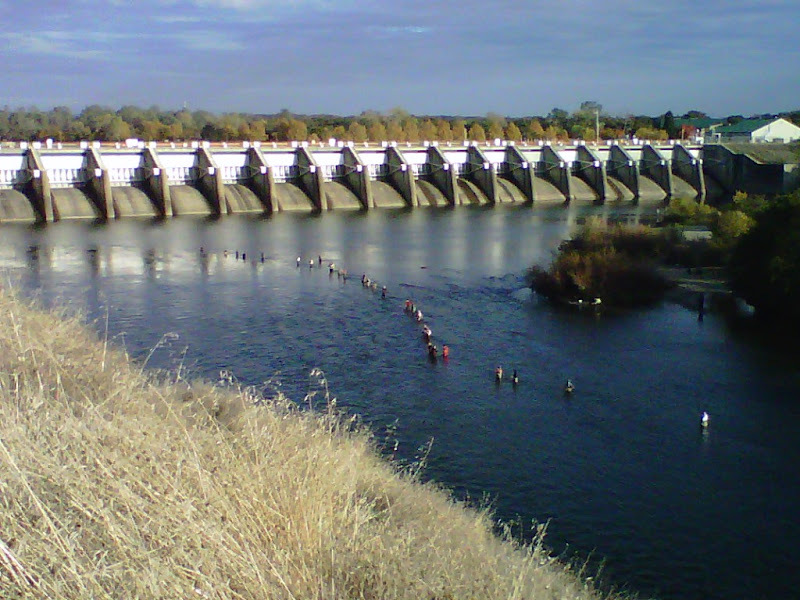 The Nimbus Hatchery fish ladder on the American River opened for the fall salmon run. Several hundred salmon most of them jumping swam up the fish ladder to the delight of crowd that lined the fences. After about an hour over 700 salmon of the 1,500 needed were in the hatchery. It is stuff like this that reminds that I need to get out more. We have some pretty cool things going on in this area. so the fishermen are catching and stealing them before they can be spawned, or they are the fishery workers? I think they are fisherman catching the fish who didn’t make the ladder or the ladder was closed and they have no where else to swim. I’m no expert, but it was an interesting sight. Next Next post: “Chapter 11 Pavilion” Has a Nice Ring, No?